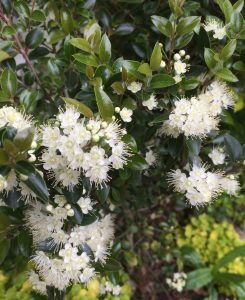 Unusual Myrtle from Chile that I’ve grown for many years and though it is difficult to root from cuttings we still offer it. Glossy small leaves have the distinct fragrance of citrus when bruised. A tall rainforest tree in its home, in my garden it is a columnar evergreen shrub to 8′ x 2′ in 7 years. In early summer it produces clusters of pretty off-white flowers that are lightly fragrant too. They often turn into clusters of black berries by autumn. Slow growing in youth it picks up a little with age. Full sun to part shade in a protected location. Mine is against an east facing wall and it’s never been damaged by cold – save for a few burned tips below 10ºF. Surprising. 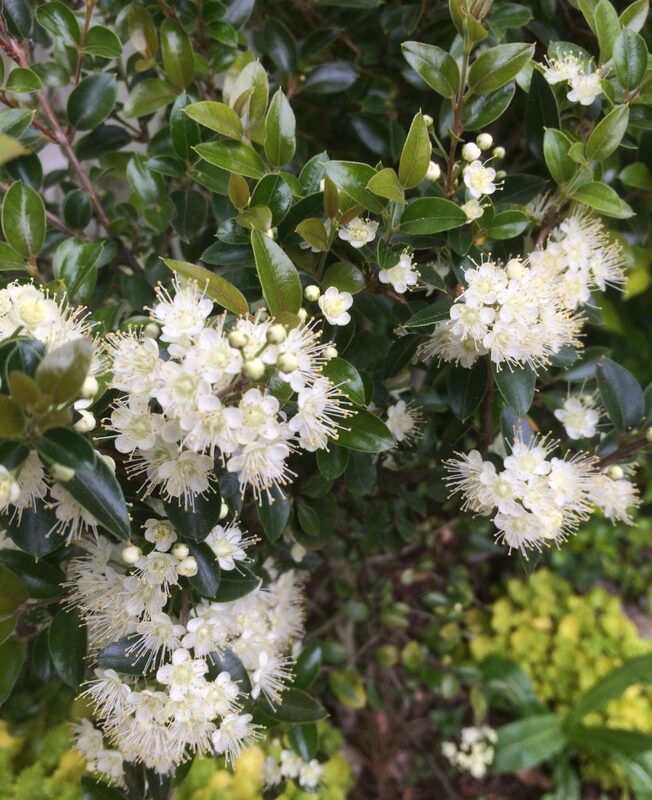 If you are a collector and you’d like something different give this handsome shrub/tree a try. It will thrive at the Oregon Coast and likely grow much, much bigger. A water loving tree that requires regular irrigation during summer- this encourages growth and lustrous foliage. Chile.